So I recently acquired a Sachen game, 4B-007 “4 in 1”. Of course, I had to open it somehow to look inside… Cartridges are a bit smaller than regular Game Boy cartridges and they lack a screw at the back. So with no easy way to open it and prying and shoving on the edges not helping, I had to resort to a more forceful approach. So I used my trusty dremel to dremel the back off where the screw was supposed to be. I pretty much dremeled away until I could make out what was holding the shells together. I hit part of the PCB — see that green smear :)? — but no worries there. So after violently separating the shells, I now know how they were assembled. Turns out they used four snap-fit lugs on the sides — 1.0cm and 4.4cm down from the top edge on both sides, in case you were wondering — as well as a press-fit connection instead of a screw. Basically, what you can see in the shell images are the outer hub on the back shell with a hole in it where I dremeled the base of the shaft away. And yes, I just googled these terms. Part of the shaft can be seen in the hub on the front shell. The hub on the front shell in turn is a shaft of its own for the hub on the back shell. No idea if there are barbs at the end of the inner shaft, I doubt it though. The picture on the left shows what it would look like if I had not broken it. 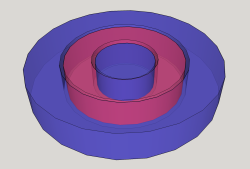 Blue hub and shaft on the back shell, red hub on the front shell; not to scale. These cartridges were obviously never made with servicing or opening in mind. It should be possible to gently unhinge the lugs and then pull the press-fit joint apart, but it probably requires a really sensitive approach to work without telltale signs of the cartridge having been opened. Well, the inside was kind of a let-down. I was kind of eager to find a full-size PCB with mapper plus ROM. What I found was a reduced-size PCB called SA-111 with a COB glob-top. This is actually mapper and ROM in one. I already found out how the Sachen mapper fools the DMG, but I need some time to merge the changes into a dumper firmware to dump the ROM. Also notice how the two holes on the left are actually pads for an electrolytic capacitor which was not fitted and not vias. See also a related post here, which I only found after brutalizing my game.